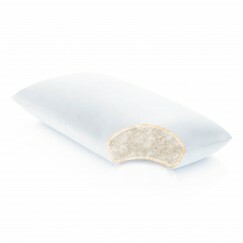 The Malouf Gel Convolution Pillow is created for ultimate versatility and comfort. The Gel Convolution™ pillow includes a removable Gel Dough® core encased in Gelled Microfiber® fill offering different levels of customizable support for all sleeping positions. The convoluted memory foam core is infused with gel to create a cooler sleeping atmosphere. The outer layers of the pillow are made of gel-coated microfibers offering a luxurious down feel without odors, allergens and sharp quills. The 100% Tencel® cover enhances the cooling effect by wicking away moisture and helping regulate temperature. SKU: M1. Categories: All Over Sleeper Pillows, Back Sleeper Pillows, Gel Featured, Gel Pillows, Malouf, Malouf Gel Pillows, Pillows, Side Sleeper Pillows, Stomach Sleeper Pillows, Top Sellers - Pillows & Protectors.